Last Monday started like any other day. Our alarm went off at 7:00. I woke Noah at 7:10 and sent him, eyes still half-closed, downstairs for frozen waffles. 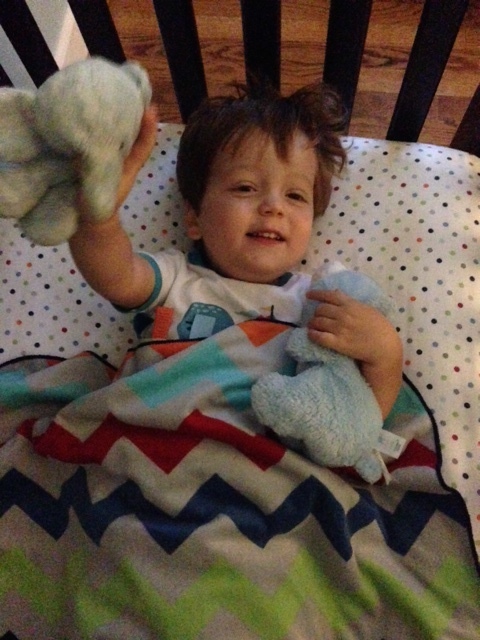 I got Rory out of his crib, changed his diaper, and watched him slide Ellie, his stuffed elephant, down the bannister before bumping down the stairs himself. I poured coffee and ate granola and yogurt. 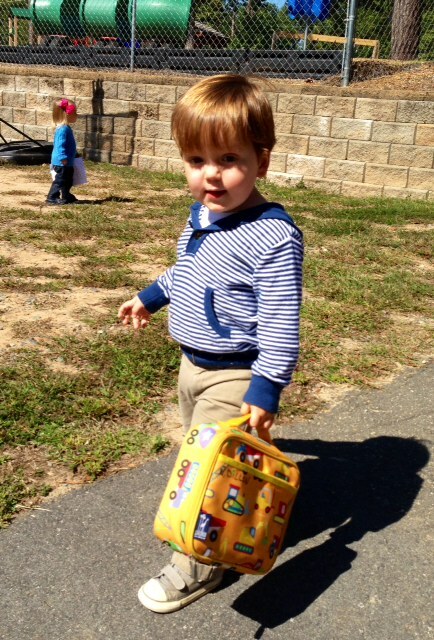 I put Noah’s class folder, water bottle, snack and lunchbox in his backpack. But: instead of splashing water on my face and running a brush through my hair, I got in the shower. Instead of yoga pants, I put on mascara. I used the hairdryer. I left my flip-flops in the closet, and put on heels. “Mom, why are you wearing tap shoes?” Noah asked as I clicked down the stairs. I took diapers, coupons and a plastic baggie of Goldfish crackers out of my bag and replaced them with my old green portfolio, a container of lightly salted almonds and a can of orange LaCroix. And then, for the first time in 15 months, I drove to work. If two weeks ago you had told me that I was going to be working on Monday, I would have laughed. After all, I’d just been telling everyone how I’d finally started enjoying staying home. A lot has changed in the last 15 months. In the last two months, for that matter. Since September, Noah dashes to the bus every morning at 8:00, returns at 4:00 and either runs right back outside or upstairs to his room to play. His days are long, but he loves kindergarten. He’s particularly obsessed with earning “purple falcons” for good behavior, and his recent ascension to “blue falcon,” the pinnacle of elementary school success that culminates with a quarterly breakfast. 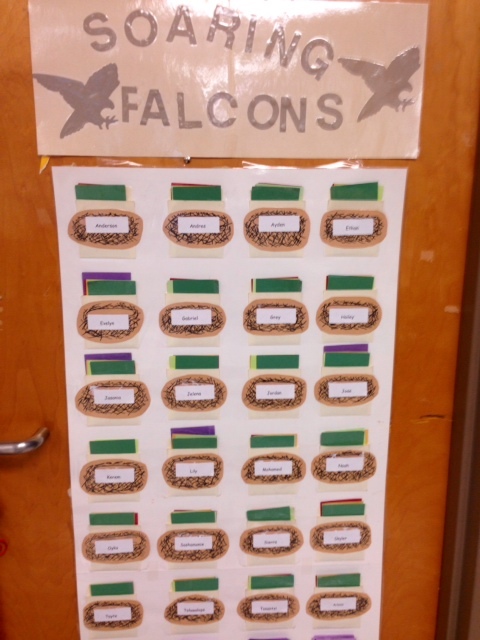 Noah wants to make “falcon nests” like these for home so he can reward Pat and me for good behavior. Um, no. Rory loves school, too. He barely pauses to say goodbye – or take off his coat, for that matter – when I drop him off every Monday, Wednesday and Friday morning. While he’s at school, I can go to Target in peace, or go for a run, or volunteer, or clean the house. We have our routines for his home days, too: library story time, playground, grocery store, YMCA. In the afternoons, while Noah is still at school, Rory naps. Which means I can nap. I limit it to 20 minutes, but still, it’s a nap. While he sleeps, I can straighten up, or prep for dinner, or catch up on reading blogs. Though it hasn’t shown up here, I’d also been writing every day as part of an online writing class. Don’t get me wrong; it’s by no means stress-free: there are meltdowns over having to wear shoes, defiant moments when Rory looks me in the eye and dumps his milk out on the floor, screaming fights between Noah and Rory over who was playing with which toy first and who touched who and who turned the TV on or off and Mommm!!! But overall, it had gotten to a place where I was like, “Oh, this is pretty nice. I could do this for a while.” It made me happy to spend time with Rory. I was glad to give Noah a snack and hear about this day when he got home. As much as I hate cleaning, it felt good to get it done during the week so we didn’t have to worry about it on the weekend. And it was nice to have some free time. I was working out, cooking, writing. I hadn’t been blogging much; I think it’s because every time I started, I thought, Who wants to hear about how “fine” everything is? So why, in the midst of that good place, did I say yes to going back to work? Well, for starters, the job offer was from my former employer, the ad agency where I worked for over six years before being laid off. And the person who called me was a friend of mine, an account person who used her skills to sell me on the job without giving me the chance freak out about it. And while the position is for an intense project for a potentially challenging client, it’s only six weeks. Like childbirth, or running that half marathon, I can do ANYTHING if I know it will be over in a finite period of time. Logistically, there was the issue of finding childcare for Rory. But coincidentally and extremely fortunately, my mom was in town for my first few days of work. Our old nanny, the much beloved Kelly, was available to cover a couple days. And we found a former preschool teacher to take care of Rory for the next month. I was worried about telling Noah. He’s old enough now to voice his opinion about me going back to work. But he only had one concern. “I will not miss your breakfast,” I vowed. 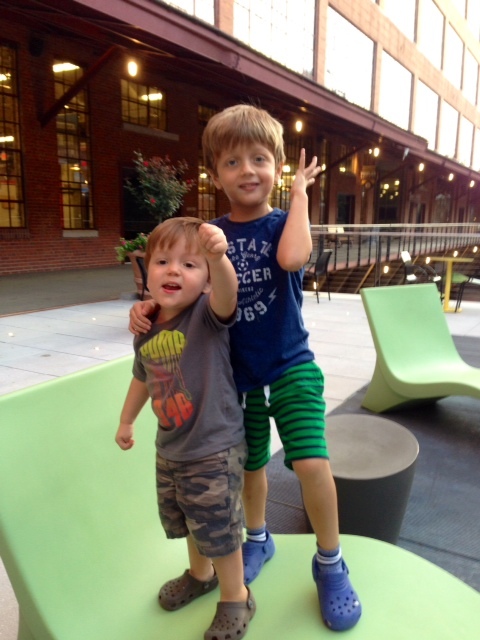 The kids love visiting the American Tobacco Campus where Pat and I now both work. I also thought Pat would have some reservations. He’ll be the first to tell you it’s been nice for him to have me at home. There’s rarely a question of who’s taking the kids to school or preparing lunches. The bathrooms are magically cleaned while he is at work. So I was surprised at how amenable he was to the idea. But I hadn’t factored in the pressure he feels being the sole bread winner. Sure, he was happy about me getting an opportunity to go back to the social and mental stimulation of my old job. But mostly, I think he was relieved that we’d finally be able to pay off the washer and dryer. As of today, I’ve been back for one week. And (knock on wood) I have to say that it’s been pretty nice. Granted, the project I’m on changed direction, so there’s been something of a calm before the storm. That doesn’t mean we haven’t already had a couple 5:30 client calls. There’s already been some takeout, and I missed dinner altogether one night. But I haven’t missed a bedtime yet. Being at work makes me appreciate the time I get to spend with my kids when I’m not working. But I don’t sit at work all day worrying about them. I know they’re in good hands. And I feel energized. For the last 15 months, by 5:30 I’d be exhausted and counting the minutes until Pat got home so I could hand the kids off to him. It’s been a nice change to come through the door to be greeted by kids yelling “Mommy!” and bowling me over with hugs. I know, I know, it’s only been a week. I’m in the honeymoon phase. And I’m not saying I’m ready to go back to work permanently. But I feel really lucky to have this opportunity to try it again. Before I start taking for granted all the good things at home. Good for you! I’m still trying to get over the panic stage of thinking of going back to work (also came from advertising agency background). Youngest is in full time school now and both kids like to complain that they’re the only ones without nannies. Hope you have a great six weeks! I have definitely been shaking a lot of cobwebs out of the old brain, but the transition back hasn’t been quite as hard as I thought it would be. Then again, that’s easy to say knowing it’s short term. Good luck!